Cutting Worker Costs Key To Automakers' Survival For decades, U.S. automakers have been paying more for the same hour of work than foreign manufacturers with plants in the U.S. If General Motors and Chrysler fail to cut those costs, they face bankruptcy, President Bush said in extending $17.4 billion in loans to Detroit. 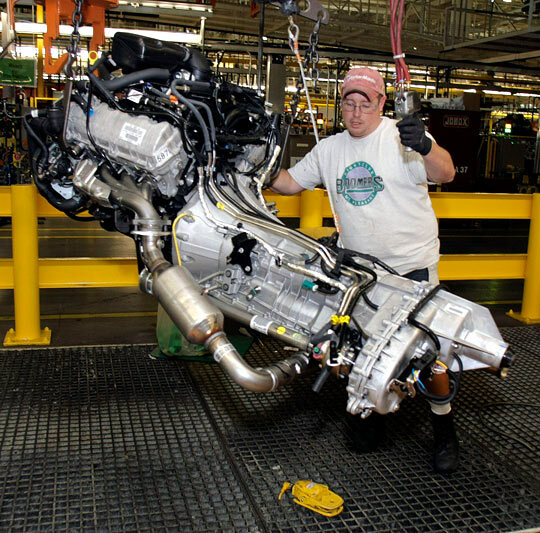 An assembly-line worker installs an engine into a new Ford F-150 truck at a plant in Dearborn, Mich., in October. For decades, U.S. automakers have been paying more for the same hour of work than foreign manufacturers with plants in the U.S.
Last week, President Bush extended a $17.4 billion lifeline to General Motors and Chrysler, requiring significant restructuring that includes making hourly employee costs competitive with Toyota, Honda and other foreign companies by the end of 2009. If GM and Chrysler fail to make the changes, they face bankruptcy, the president said. The current per-hour employee cost for U.S. automakers is around 50 percent higher than the costs for their foreign counterparts. The difference, however, is not simply a matter of hourly wage. As it turns out, the real wage discrepancy mostly comes down to retiree benefits. But, as part of their contract agreements with the United Auto Workers, the Detroit Three also pay the cost of health care for life for their retirees, along with a generous pension package. Those retiree "legacy costs" mean an extra $16-$18 per hour in costs compared to the $3 per hour that the Japanese automakers spend in retiree benefits, according to the Oliver Wyman consulting firm that publishes the Harbour Report, a labor productivity analysis for car manufacturers. That differential reflects two distinctions between U.S. and foreign automakers, says Michelle Hill, a vice president at Oliver Wyman in Troy, Mich.
First, the foreign manufacturing plants tend to be newer than the Detroit Three's U.S. plants, meaning there are fewer retirees who need benefits. Between GM and Chrysler, there are 325,000 retirees receiving benefits. The foreign automakers have just a tiny fraction of the number of retirees to care for, Hill says. Second, the workers at the foreign auto companies are not unionized, which means they have not bargained for the generous retiree benefits of a UAW worker. That means no defined pension plan and no health care for life. So even as the number of foreign autoworker retirees increases, the legacy costs should not reach those of the U.S. automakers. Foreign manufacturers have "learned from the mistakes of the U.S. automakers, and their retiree costs probably won't be as high," Hill says. In 2007, the extra legacy costs amounted to an additional $1,800 for each car the Detroit Three produced. But now, with the auto market suffering and production down significantly, the retiree costs are spread out over fewer cars. A drop in production has also meant fewer workers are needed. The companies are encouraging early retirement, increasing the number of retirees even further. Legacy costs now tack on an additional $3,000 to each American car that rolls off the assembly line, Hill says. Not surprisingly, the UAW is loath to give up benefits for retirees. "We're willing to do more, but we want to see what other people will do before we have to continue to draw that last drop of blood," UAW president Ron Gettelfinger told Fox Business News. The UAW says it has already made serious concessions. In a labor agreement last year, the union agreed to a two-tier wage and benefit structure, which would significantly reduce employee costs for many future hires by cutting hourly wages to around $15, significantly reducing pension benefits and eliminating retiree health care. The plan has started to work in some factories, but with few new workers being hired, Hill says, the two-tier structure has yet to make a significant difference for the Detroit Three. The 2007 labor agreement would also reduce legacy costs in the long term by shifting the high cost of retiree health care benefits to the UAW with a program called the Voluntary Employees Benefits Association (VEBA). The automakers promised billions of dollars so that the union could cover the future medical expenses for retirees, but the companies don't have that kind of cash right now. As part of the government's new $17.4 billion loan package for GM and Chrysler, President Bush told the UAW it must take half of its payments in weakened company stock. Patrick Anderson of the Anderson Economic Group, a consulting firm in East Lansing, Mich., that does extensive work for the auto industry, says wage structure and legacy costs are only part of the problem. Another weakness, he says, are the work rules that make it "significantly harder to put workers on actual production jobs." Anderson points to the jobs bank program, which guarantees laid-off workers benefits and most of their wages while they wait for work. The jobs bank is already much smaller than it has been in the past. But, Anderson says, it has "historically required the Detroit Three to pay for more hours of work in order to get an hour of work on the assembly line accomplished," and has therefore made it difficult for the U.S. automakers to compete with foreign manufacturers. The jobs bank program is also on the chopping block under the new $17.4 billion bailout plan. So far, the Detroit Three and the UAW have avoided specifics when discussing plans to make their employee costs more competitive. But Hill says it's definitely doable. "With the VEBA [retiree benefits program] and the tier wages in place, I think they're going to be within the $5 mark of the Japanese," she says. Maybe not by the end of 2009, as the bailout requires, she says, but by 2010 or 2011, the Detroit Three have a real shot at making a comeback.